None will deny that the ultimate purpose of economic development is to ensure and improve the well-being of the people. All practical problems in the every-day-life of the masses should claim the attention of the social service NGOs as well as the rulers. It is our duty to attend to these problems, solve them and satisfy the needs of the’ masses. In the past, what everyone wanted was to have enough food, schools for their children and a place to live. Now the people have more diversified needs. One such need is clean water. Amaradasa Gunawardana the President of Sri Lanka Belgium Association (SLBA) highlighted the necessity of having purified drinking water, particularly in the dry zone. Gunawardana is involved in many social service projects. This NGO conducts several projects that include the free construction of houses, establishment and running of pre-schools, offering scholarship schemes etc. Their latest activity is the construction of projects to supply purified drinking water. Water is a pressing demand in remote villages in the dry zone. The districts of Polonnaruwa, Anuradapura and Kurunegala are in the forefront of these demands. 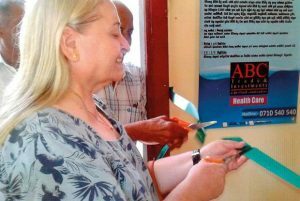 The Sri Lanka Belgium Association has already opened up schemes of purified drinking water in these remote areas free of charge. Over 250 families with a population of nearly 2000 now enjoy purified drinking water. Kajuwatta has taken over the management of this project. The next request for such a project was made to Sri Lanka Belgium Association by members of a village called Hidogama in Nachchaduwa area in the Anuradapura District. The third drinking water project was declared open by Madam Linda Stabel the President of Adoptie Sri Lanka Belgium VZW on June 24. Samagi Rural Development Society of Hidogama will oversee the management of the new project. Mr. Gunawardana the President of Sri Lanka Belgium Association states that Adoptie Sri Lanka Belgium VZW is always willing and ready to promote more projects in Sri Lanka. This philanthropic organisation in Belgium is established exclusively to help Sri Lanka.